In March of 1980, just a month before Sartre's death, "Le Nouvel Observateur" published a series of interviews between the blind and debilitated philosopher and his young assistant, Benny Levy. Readers were scandalized and denounced the interviews as distorted, inauthentic and even fraudulent. They seemed to portray a Sartre who had abandoned his leftist convictions and rejected his most intimate friends, including Simone de Beauvoir. This man had cast aside his own fundamental beliefs in the primacy of individual consciousness, the inevitability of violence and Marxism, embracing instead a messianic Judaism. No, Sartre's supporters argued, it was his interlocutor, the ex-radical, the orthodox, ultra-right-wing activist who had twisted the words and thought of an ailing Sartre to his own ends. However, shortly before his death, Sartre confirmed the authenticity of the interviews and their puzzling content. Since then, Sartre scholars have sought to unravel and understand these interviews. Presented in this translation, the interviews are framed by two essays by Benny Levy himself, accompanied by an introduction by Ronald Aronson. 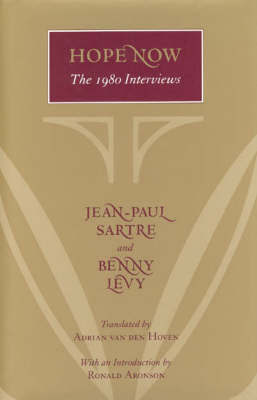 Placing the interviews in proper biographical and philosophical perspective, Aronson demonstrates that the thought of both Sartre and Levy reveals multiple intentions that, taken together, nevertheless confirm and add to Sartre's overall philosophy.